The Tāj Mahal (Hindi: ताज महल) is a mausoleum located in Agra, India. 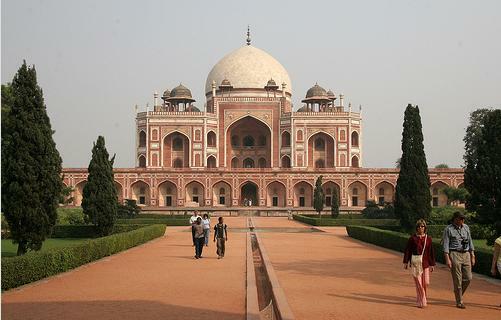 The Mughal Emperor Shāh Jahān commissioned it as a mausoleum for his favourite wife, Mumtaz Mahal. Construction began in 1632 and was completed in 1648. 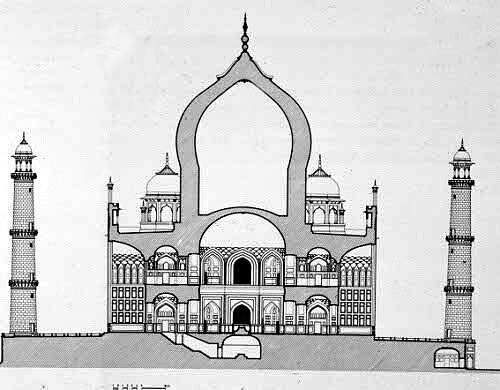 Some dispute surrounds the question of who designed the Taj; it is clear a team of designers and craftsmen were responsible for the design, with Ustad Isa considered the most likely candidate as the principal designer. The Taj Mahal (sometimes called "the Taj") is generally considered the finest example of Mughal architecture, a style that combines elements of Persian, Indian and Islamic architecture. While the white domed marble mausoleum is the most familiar part of the monument, the Taj Mahal is actually an integrated complex of structures. It was listed as a UNESCO World Heritage Site in 1983 when it was described as a "universally admired masterpieces of the world's heritage". The Taj Mahal incorporates and expands on many design traditions, particularly Hindu, Persian and earlier Mughal architecture. 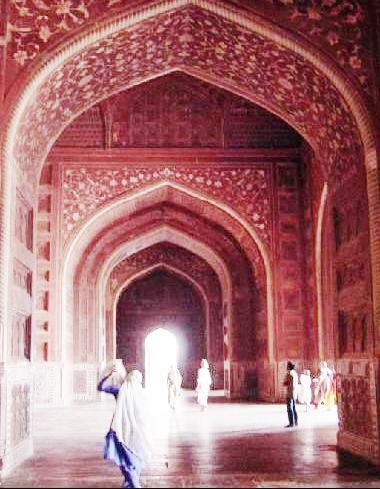 Specific inspiration came from a number of successful Timurid and Mughal buildings. These include the Gur-e Amir (the tomb of Timur, progenitor of the Mughal dynasty, in Samarkand), Humayun's Tomb, Itmad-Ud-Daulah's Tomb (sometimes called the Baby Taj), and Shah Jahan's own Jama Masjid in Delhi. Under his patronage, Mughal building reached new levels of refinement. 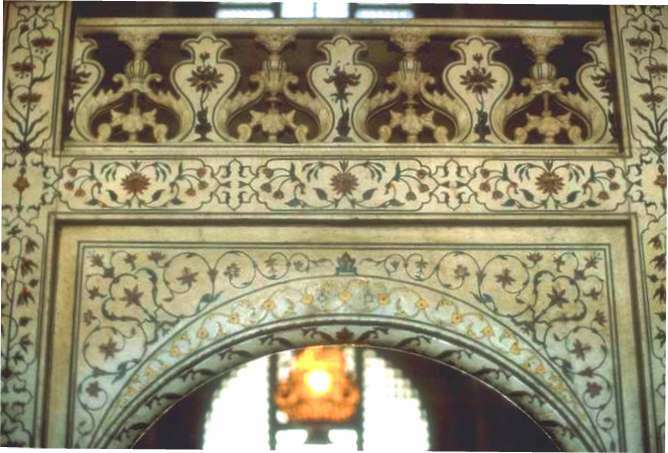 Whilst previous Mughal building had primarily been constructed of red sandstone, Shah Jahan promoted the use of white marble inlaid with semi-precious stones. Hindu craftsmen, particularly sculptors and stonecutters, plied their trade throughout Asia during this period, and their skills were particularly sought after by tomb builders. Whilst the rock-cut architecture which characterises much of the construction of this period had little influence on the Taj Mahal (carvings are only one form of the decorative element), other Indian buildings such as the Man Singh palace in Gwalior were an inspiration for much Mughal palace architecture and the source for the chhatris which can be seen on the Taj Mahal. 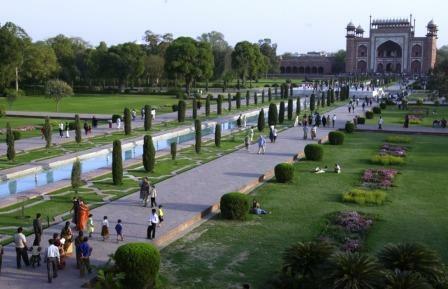 The complex is set in and around a large charbagh (a formal Mughal garden divided into four parts). 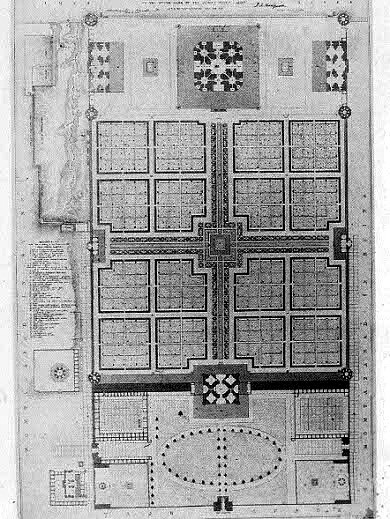 Measuring 320 m × 300 m, the garden uses raised pathways which divide each quarter of the garden into 16 sunken parterres or flowerbeds. A raised marble water tank at the centre of the garden, halfway between the tomb and the gateway, and a linear reflecting pool on the North-South axis reflect the Taj Mahal. Elsewhere the garden in laid out with avenues of trees and fountains. The charbagh garden was introduced to India by the first Mughal emperor Babur, a design inspired by Persian gardens. The charbagh is meant to reflect the gardens of Paradise (from the Persian paridaeza -- a walled garden). In mystic Islamic texts of the Mughal period, paradise as described as ideal garden, filled with abundance. Water plays a key role in these descriptions: In Paradise, these text say, four rivers source at a central spring or mountain, and separate the garden into north, west, south and east. Most Mughal charbaghs are rectangular in form, with a central tomb or pavilion in the centre of the garden. The Taj Mahal garden is unusual in siting the main element, the tomb, at the end rather than at the centre of the garden. But the existence of the newly discovered Mahtab Bagh or "Moonlight Garden" on the other side of the Yamuna provides a different interpretation -- that the Yamuna itself was incorporated into the garden's design, and was meant to be seen as one of the rivers of Paradise. The two buildings are precise mirror images of each other. The western building is a mosque; its opposite is the jawab or "answer", whose primary purpose was architectural balance (and which may have been used as a guesthouse during Mughal times). The distinctions are that the jawab lacks a mihrab, a niche in a mosque's wall facing Mecca, and the floors of the jawab have a geometric design, while the mosque floor was laid out the outlines of 569 prayer rugs in black marble. The mosque's basic design is similar to others built by Shah Jahan, particularly to his Jama Masjid in Delhi: a long hall surmounted by three domes. Mughal mosques of this period divide the sanctuary hall into three areas: a main sanctuary with slightly smaller sanctuaries to either side. At the Taj Mahal, each sanctuary opens on to an enormous vaulting dome. 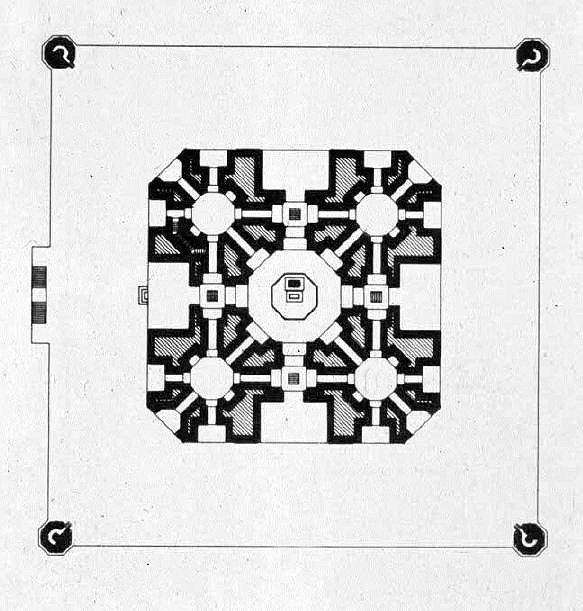 Simplified diagram of the Taj Mahal floor plan. The tomb stands on a square plinth. The base structure is a large, multi-chambered structure. 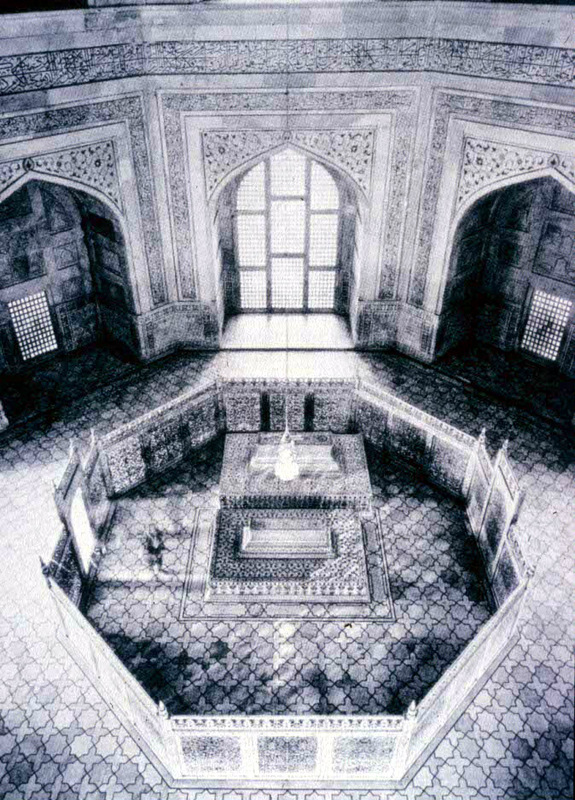 The main chamber houses the cenotaphs of Shah Jahan and Mumtaz (the actual graves are a level below). The base is essentially a cube with chamfered edges, roughly 55 metres on each side (see floor plan, right). 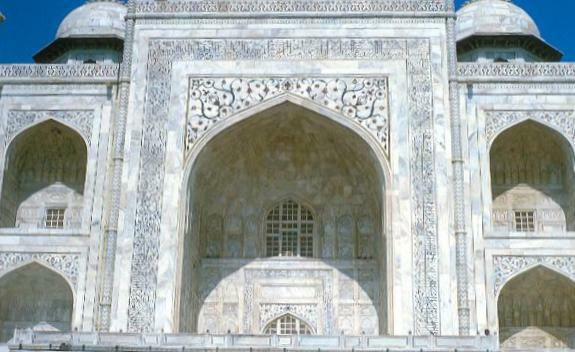 On the long sides, a massive pishtaq, or vaulted archway, frames the iwan, with a similar arch-shaped balcony above. These main arches extend above the roof of the building by use of an integrated facade. To either side of the main arch, additional pishtaqs are stacked above and below. 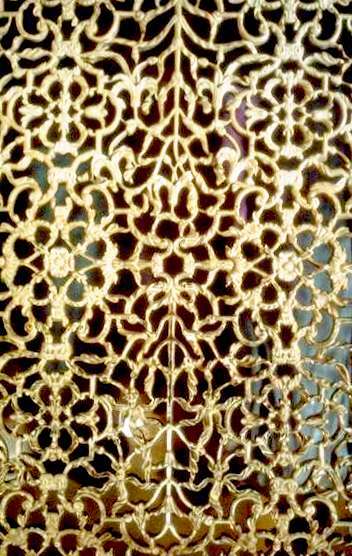 This motif of stacked pishtaqs is replicated on the chamfered corner areas. The design is completely uniform and consistent on all sides of the building. 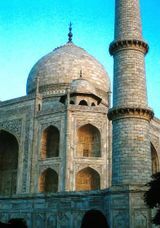 Four minarets, one at each corner of the plinth, facing the chamfered corners, frame the tomb. The marble dome that surmounts the tomb is its most spectacular feature. Its height is about the same size as the base of the building, about 35 m. Its height is accentuated because it sits on a cylindrical "drum" about 7 m high. Because of its shape, the dome is often called an onion dome (also called an amrud or guava dome). 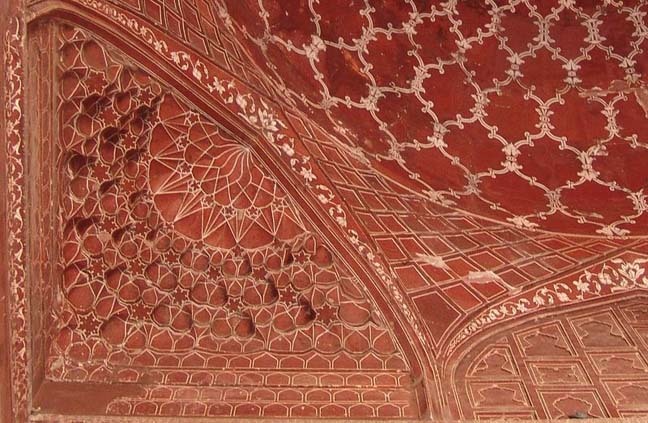 The top of the dome is decorated with a lotus design, which serves to accentuate its height. The dome is topped by a gilded finial, which mixes traditional Islamic and Hindu decorative elements. The dome shape is emphasised by four smaller domed chattris (kiosks) placed at its corners. The chattri domes replicate the onion shape of main dome. Their columned bases open through the roof of the tomb, and provide light to the interior. The chattris also are topped by gilded finials. The main dome is crowned by a gilded spire or finial.The finial used to be made of gold until the early 1800's, but is now made of bronze. The finial provides a clear example of the integration of traditional Islamic and Hindu decorative elements. The finial is topped by a moon, a typical Islamic motif, whose horns point heavenward. Because of its placement on the main spire, the horns of the moon and the finial point combine to create a trident shape -- reminiscent of the traditional Hindu symbols of Shiva. Similarly, the spire is made up of a number of bulbous forms. The central form bears a striking resemblance to a Hindu sacred water vessel (kalash or kumbh)..
At the corners of the plinth stand minarets: four large towers each more than 40 m tall. The minarets again display the Taj Mahal's basic penchant for symmetrical, repeated design. Nearly every surface of the entire complex has been decorated. The exterior decorations of the Taj Mahal are among the finest to be found in Mughal architecture of any period. Once again, decoration motifs are repeated throughout the complex. As the surface area changes -- a large pishtaq has more area than a smaller -- the decorations are refined proportionally. Islamic strictures forbade the use of anthropomorphic forms. Throughout the complex passages from the Qur'an are used as decorative elements. 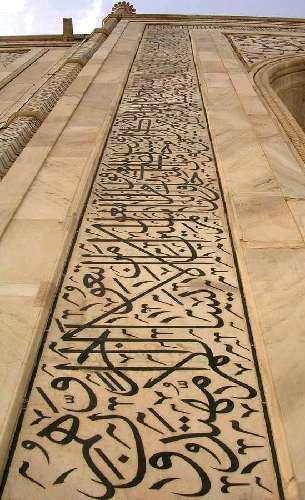 The calligraphy is a florid and practically illegible thuluth script, created by the Mughal court's Persian calligrapher, Amanat Khan, who was resident at the Mughal court. He has signed several of the panels. As one enters through the Taj Mahal Gate the calligraphy reads "O Soul, thou art at rest. Return to the Lord at peace with Him, and He at peace with you." Recent scholarship suggests that Amanat Khan chose the passages as well. The texts refer to themes of judgment: of doom for nonbelievers, and the promise of Paradise for the faithful. The passages include: Surah 91 (The Sun), Surah 112 (The Purity of Faith), Surah 89 (Daybreak), Surah 93 (Morning Light), Surah 95 (The Fig), Surah 94 (The Solace), Surah 36 (Ya Sin), Surah 81 (The Folding Up), Surah 82 (The Cleaving Asunder), Surah 84 (The Rending Asunder), Surah 98 (The Evidence), Surah 67 (Dominion), Surah 48 (Victory), Surah 77 (Those Sent Forth) and Surah 39 (The Crowds). The dado frames and archway spandrels have been decorated with pietra dura inlays of highly stylised, almost geometric vines, flowers and fruits. The inlay stones are yellow marble, jasper and jade, levelled and polished to the surface of the walls. The interior chamber of the Taj Mahal steps far beyond traditional decorative elements. One may say without exaggeration that this chamber is a work of jewellery. Here the inlay work is not pietra dura, but lapidary. The inlay material is not marble or jade but precious and semiprecious gemstones. Every decorative element of the tomb's exterior has been redefined with jeweler's art. 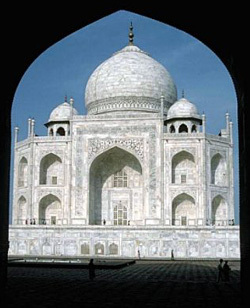 The inner chamber of the Taj Mahal contains the cenotaphs of Mumtaz and Shah Jahan. It is a masterpiece of artistic craftsmanship, virtually without precedent or equal. The inner chamber is an octagon. While the design allows for entry from each face, only the south (garden facing) door is used. The interior walls are about 25 m high, topped by a "false" interior dome decorated with a sun motif. Eight pishtaq arches define the space at ground level. As is typical with the exterior, each lower pishtaq is crowned by a second pishtaq about midway up the wall. The four central upper arches form balconies or viewing areas; each balcony's exterior window has an intricate screen or jali cut from marble. In addition to the light from the balcony screens, light enters through roof openings covered by the chattris at the corners of the exterior dome. Each of the chamber walls has been highly decorated with dado bas relief, intricate lapidary inlay and refined calligraphy panels, reflecting in miniature detail the design elements seen throughout the exterior of the complex. 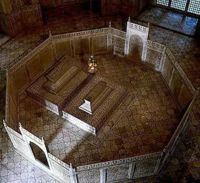 Muslim tradition forbids elaborate decoration of graves, so the bodies of Mumtaz and Shah Jahan are laid in a relatively plain chamber beneath the inner chamber of the Taj Mahal. They are buried on a north-south axis, with faces turned right (west) toward Mecca. 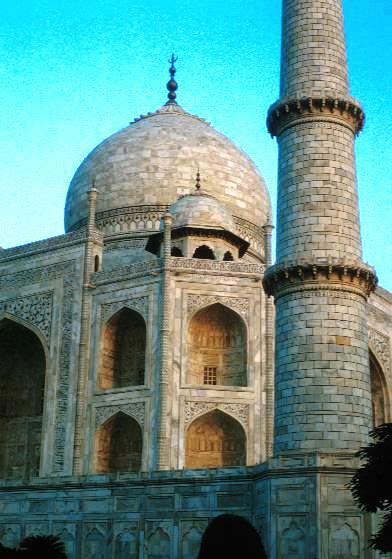 The Taj Mahal has been raised over their cenotaphs (from Greek keno taphas, empty tomb). The cenotaphs mirror precisely the placement of the two graves, and are exact duplicates of the grave stones in the basement below. 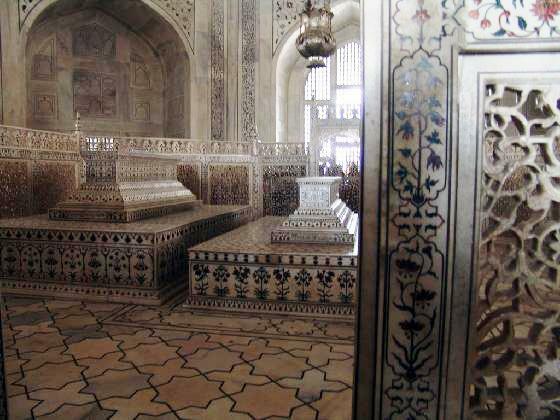 Mumtaz's cenotaph is placed at the precise centre of the inner chamber. On a rectangular marble base about 1.5 by 2.5 m is a smaller marble casket. Both base and casket are elaborately inlaid with precious and semiprecious gems. Calligraphic inscriptions on the casket identify and praise Mumtaz. On the lid of the casket is a raised rectangular lozenge meant to suggest a writing tablet. The Taj Mahal was built on a stretch of land to the south of the walled city of Agra which had belonged to Maharajah Jai Singh: Shah Jahan presented him with a large palace in the centre of Agra in exchange. Construction began with setting foundations for the tomb. An area of roughly three acres was excavated and filled with dirt to reduce seepage from the river. The entire site was levelled to a fixed height about 50 m above the riverbank. The Taj Mahal is 180 feet tall. The dome itself measures 60 feet in diameter and 80 feet high. A fifteen-kilometre tamped-earth ramp was built to transport marble and materials from Agra to the construction site. According to contemporary accounts teams of twenty or thirty oxen strained to pull the blocks on specially constructed wagons. To raise the blocks into position required an elaborate post-and-beam pulley system. Teams of mules and oxen provided the lifting power. Water for the Taj Mahal was provided through a complex infrastructure. Water was drawn from the river by a series of purs -- an animal-powered rope and bucket mechanism. The water flowed into a large storage tank, where, by thirteen additional purs, it was raised to large distribution tank above the Taj Mahal ground level. From this distribution tank, water passed into three subsidiary tanks, from which it was piped to the complex. A 0.25 m earthenware pipe lies about 1.5 m below the surface, in line with the main walkway; this filled the main pools of the complex. Additional copper pipes supplied the fountains in the north-south canal. Subsidiary channels were dug to irrigate the entire garden. The fountain pipes were not connected directly to the feed pipes. Instead, a copper pot was provided under each fountain pipe: water filled the pots allowing equal pressure in each fountain. The purs no longer remain, but the other parts of the infrastructure have survived. The Taj Mahal was not designed by a single person. The project demanded talent from many people. The names of many of the builders who participated in the construction of the Taj Mahal in different capacities have come down to us through various sources. The Persian architect, Ustad Isa and Isa Muhammad Effendi, trained by the great Ottoman architect Koca Mimar Sinan Agha are frequently credited with a key role in the architectural design of the complex, but in fact there is little evidence to support this tradition, and the connection with Sinan (who died in 1588) is clearly a fairy-tale. 'Puru' from Benarus, Persia (Iran), has been mentioned supervising architect in Persian language texts (e.g. see ISBN 964-7483-39-2). The main dome was designed by Ismail Khan from the Ottoman Empire, considered to be the premier designer of hemispheres and builder of domes of that age. Qazim Khan, a native of Lahore, cast the solid gold finial that crowned the Turkish master's dome. Amanat Khan from Persian Shiraz, Iran was the chief calligrapher (this fact is attested on the Taj Mahal gateway itself, where his name has been inscribed at the end of the inscription). Muhammad Hanif was the supervisor of masons. Mir Abdul Karim and Mukkarimat Khan of Shiraz, Iran handled finances and the management of daily production. The creative team included sculptors from Bukhara, calligraphers from Syria and Persia, inlayers from southern India, stonecutters from Baluchistan, a specialist in building turrets, another who carved only marble flowers — thirty seven men in all formed the creative nucleus. To this core was added a labour force of twenty thousand workers recruited from across northern India. 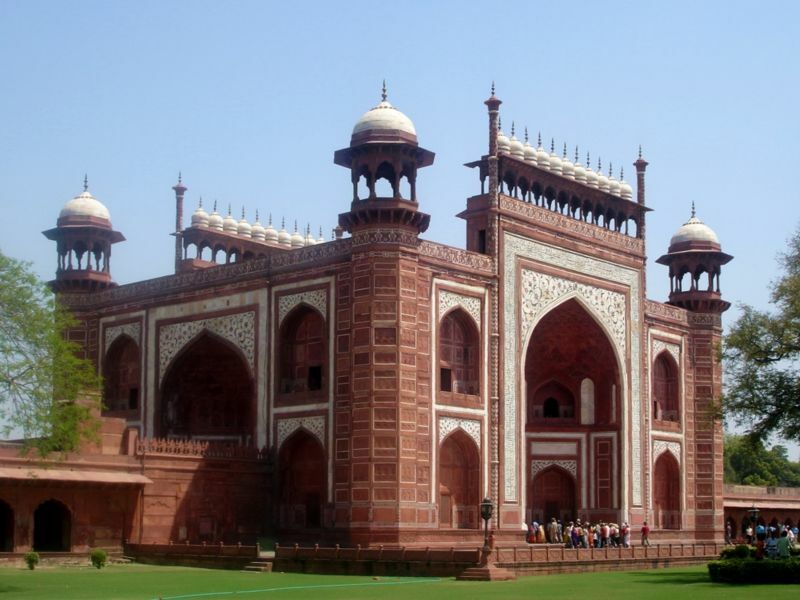 European commentators, particularly during the early period of the British Raj, suggested that some or all of the Taj Mahal was the work of European artisans. Most of these suggestions were purely speculative, but one dates back to 1640, when a Spanish Friar who visited Agra wrote that Geronimo Veroneo, an Italian adventurer in Shah Jahan's court, was primarily responsible for the design. There is no reliable scholarly evidence to back up this assertion, nor is Veroneo's name mentioned in any surviving documents relating to the construction. E.B. Havell, the principal British scholar of Indian art in the later Raj, dismissed this theory as unsupported by any evidence, and as inconsistent with the known methods employed by the designers. His conclusions were further supported by the research of Muhammad Abdullah Chaghtai, who examined carefully the origin of the tradition that the Taj was designed by a European, and concluded that it was a spurious 19th century invention, based on the misapprehension that "Ustad Isa", so often credited with the Taj's design, must have been a Christian because he bore the name "Isa" (Jesus). In fact this is a common Muslim name as well - and furthermore there is no source earlier than the 19th century which mentions an "Ustad Isa" in connection with the Taj Mahal (even if he existed he cannot, in any case, have been trained by Sinan, because the latter died in 1588). Chaghtai thought it more likely that the chief architect was Ustad Ahmad, the designer of Shahjahanabad, but admitted that this could not be conclusively proved from existing sources. The Taj Mahal was constructed using materials from all over India and Asia. Over 1,000 elephants were used to transport building materials during the construction. The translucent white marble was brought from Rajasthan, the jasper from Punjab and the jade and crystal from China. The turquoise was from Tibet and the Lapis lazuli from Afghanistan, while the sapphire came from Sri Lanka and the carnelian from Arabia. In all, 28 types of precious and semi-precious stones were inlaid into the white marble. 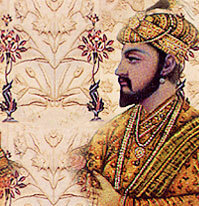 Soon after its completion, Shah Jahan was deposed and put under house arrest at nearby Agra Fort by his son Aurangzeb. Legend has it that he spent the remainder of his days gazing through the window at the Taj Mahal. Upon Shah Jahan's death, Aurangzeb buried him in the Taj Mahal next to his wife, the only disruption of the otherwise perfect symmetry in the architecture. By the late 19th century parts of the Taj Mahal had fallen badly into disrepair. During the time of the Indian rebellion of 1857 the Taj Mahal faced defacement by British soldiers and government officials who chiseled out precious stones and lapis lazuli from its walls. Recently the Taj Mahal was claimed to be Sunni Wakf property, on the grounds that it is the grave of a woman whose husband Emperor Shah Jahan was a Sunni. The Indian government has dismissed claims by the Muslim trust to administer the property, saying their claims are baseless and the Taj Mahal is Indian national property. The poet Tagore, a Nobel laureate, called Taj Mahal "a drop of tear on the cheek of history". The Taj Mahal is often described as one of the seven wonders of the modern world. 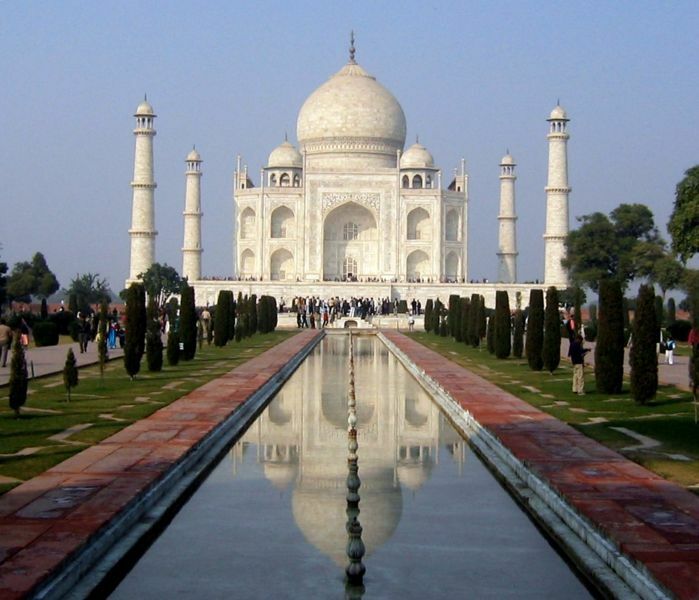 Millions of tourists have visited the site - more than three million in 2004, according to the BBC - making it one of the most popular international attractions in India. The name Taj comes from Persian, the language of the Mughal court, meaning crown, and Mahal, also Persian, means place, area, or neighborhood. Together, the term Taj Mahal translated into rough English from the original Persian means "Crown Place" or "The Place of the Crown." Some sources suggest that Taj Mahal is a shorter variant of Mumtaz Mahal, the formal court name and title of Arjumand Banu Begum, meaning First Lady of the Palace. As early as 1663, the French traveller François Bernier referred to the place as Tage Mehale. A longstanding popular tradition holds that an identical mausoleum complex was originally supposed to be built on the other side of the river, in black marble instead of white, for Shah Jahan himself. The story suggests that Shah Jahan was overthrown by his son Aurangzeb before the black version could be built. Ruins of dark marble found across the river are, the story suggests, the unfinished base of this "Black Taj". Recent scholarship disputes this theory, and throws some interesting light on the design of the Taj Mahal. All other major Mughal tombs were sited in gardens that form a cross, with the tomb at the intersection of the vertical and horizontal pieces. The Taj Mahal gardens, by contrast, form a great 'T', with the tomb at the centre of the crosspiece. 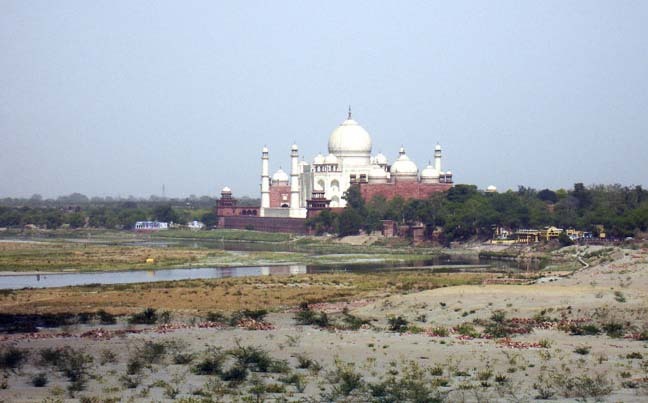 But the outline of the ruins on the other river bank would extend the design of the Taj Mahal gardens to form a cross of proportions typical of other Mughal tombs. 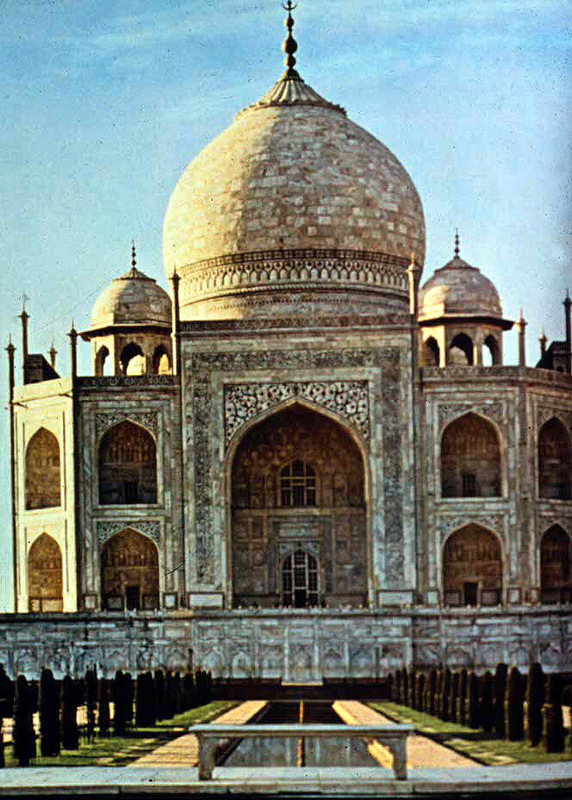 Further, the marble in the ruins opposite the Taj Mahal, while dark from staining, were originally white. In addition, an octagonal pool in these ruins would have reflected the Taj Mahal. Scholars have called these ruins the Mahtab Bagh or "Moonlight Garden". Scholars now believe that the reflection of the Taj Mahal in this pool is in fact what was meant when people referred to the 'black taj'. Shah Jehan's cenotaph, offset from center. Shah Jahan was interred at the tomb eight years after its completion. Aurangzeb had Shah Jahan's tomb and cenotaph placed in the Taj Mahal rather than building him a separate mausoleum such as other emperors had. 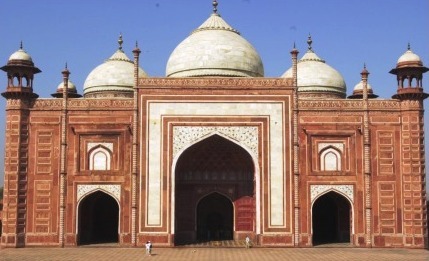 He thus "destroyed" the symmetry of the Taj Mahal design, although careful inspection shows several non-symmetric doorways, etc, in the original construction. A variation on the Black Taj legend suggests that Aurangzeb's decision was made from malice or parsimony. 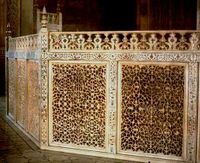 In Itmad-Ud-Daulah's Tomb however, which was a major influence on the Taj Mahal design, Aurangzeb's grandparents were interred in a similar asymmetric fashion. Note: main chamber contains cenotaphs (false tombs); the actual tombs, configured identically, are in the crypt below. 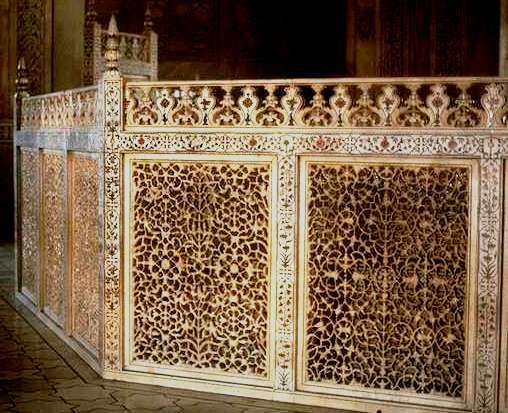 A seemingly endless number of stories describe, often in horrific detail, deaths, dismemberments and mutilations which Shah Jahan inflicted on various craftsmen associated with the tomb. No evidence for these legends exists, and no respected authority finds them credible. Gold leaf, supposed to have covered all or part of the dome. There is an often-repeated story that Lord William Bentinck, governor of India in the 1830s, planned to demolish the Taj Mahal and auction off the marble. In some versions of the tale, the demolition crew were ready to begin their work but were stopped only because Bentinck was unable to make the scheme financially viable. There is no contemporary evidence for this story, which may have emerged in the late nineteenth century when Bentinck was being criticised for his penny-pinching Utilitarianism, and when Lord Curzon was emphasising earlier neglect of the monument, and presenting himself as a saviour of Indian antiquities. According to Bentinck's biographer John Rosselli, the story arose from Bentinck's fund-raising sale of discarded marble from Agra Fort and of the metal from a famous but obsolete Agra cannon. However, others, led by the Archaeological Survey of India, still believe and argue that a sale by the British East India Company was planned under Lord Bentinck watch, though no satisfactory buyers were found. An hypothesis proposed by P.N. Oak, President of The Institute for Rewriting Indian History, asserts that the Taj Mahal was a Hindu temple of the god Shiva, usurped and remodeled by Shah Jahan. The temple's name, he says, was originally "Tejo Mahalaya" which was corrupted over time to "Taj Mahal". Oak also claims that the tombs of Humayun, Akbar and Itmiad-u-Dallah — as well as the Vatican in Rome, the Kaaba in Mecca, Stonehenge and "all historic buildings" in India — were also Hindu temples or palaces. Considering the possibility that if Taj Mahal was not a Shiva temple, he claims that it might then have been the palace of a Rajput king. In any case (he says), the Taj Mahal was Hindu in origin, stolen by Shah Jahan and adapted as a tomb — although Oak also claims that Mumtaz is not buried there. Oak further states that the numerous eyewitness accounts of Taj Mahal construction, and Shah Jahan's construction orders and voluminous financial records, are elaborate frauds meant to hide its Hindu origin. Such assertions have gained a lot of popular interest and made Oak a well-known media figure. Oak's assertions are not accepted by legitimate scholars, but his theories are have been publicized by some contemporary Hindutva (Hindu nationalist) activists. He has sued to break open the cenotaphs, and to tear down brick walls in the lower plinth: In these "fake tombs" and "sealed apartments", Oak says Shivalingams or other temple items were hidden by Shah Jahan. According to Oak, the Indian government's refusal to allow him unfettered access amounts to a conspiracy against Hinduism. 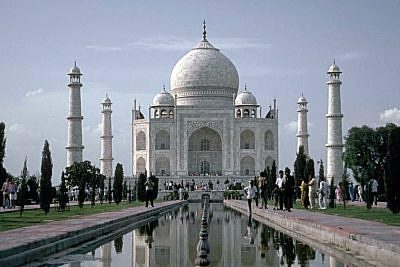 In 2000 India's Supreme Court dismissed Oak's petition to declare that a Hindu king built the Taj Mahal and reprimanded him for bringing the action. In 2005 a similar petition was dismissed by the Allahabad High Court. This case was brought by Amar Nath Mishra, a social worker and preacher who claims that the Taj Mahal was built by the Hindu King Parmar Dev in 1196. The Question of the Taj Mahal by Bhat, P.S. ; Athawale, A.L. (1985). Itihas Patrika, vol.5. Was the Taj Mahal a Vedic Temple? The Photographic Evidence! Stephen Knapp. 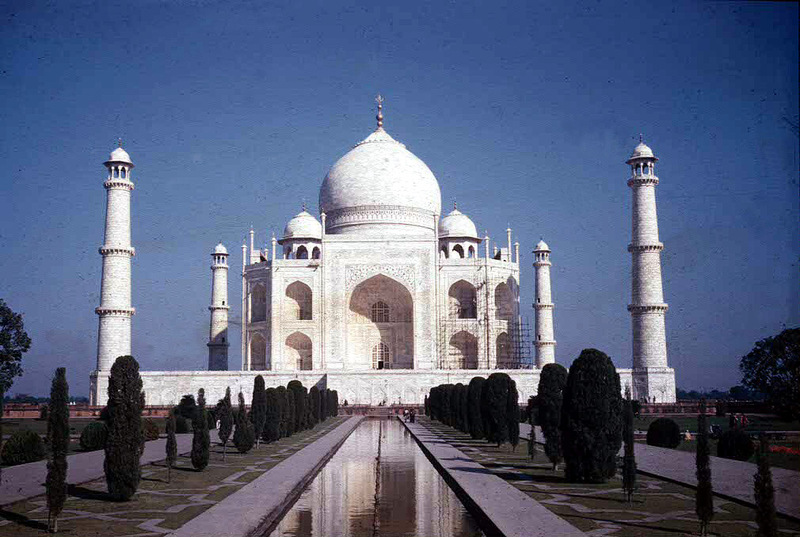 "An Architect Looks at the Taj Mahal Legend" by Marvin Mills. The Letter of Aurangzeb ordering repairs to the Taj Mahal in the year just before it is said to have been completed. The Badshahnama is the history written by the Emperor's own chronicler. Knapp argues that this proves that Shah Jahan had acquired the Taj Mahal from the previous owner, Jai Singh, grandson of Raja Mansingh, after selecting this site for the burial of Queen Mumtaz. Koch, Ebba [Aug 2006]. The Complete Taj Mahal: And the Riverfront Gardens of Agra (Paperback), First (in English), Thames & Hudson Ltd, 288 pages. ISBN 0500342091. Explore the Taj Mahal Online virtual tour with 360° panoramas & downloadbale school assets.